Discussion in 'Skydentify - What is that Thing in the Sky?' started by Jay Reynolds, Nov 25, 2013. Beck did a pretty good job on the photo. Thanks, Mick. ATLA... Yes, it fits perfectly! Hopefully this can solve her mystery. I missed this. What is this about then? 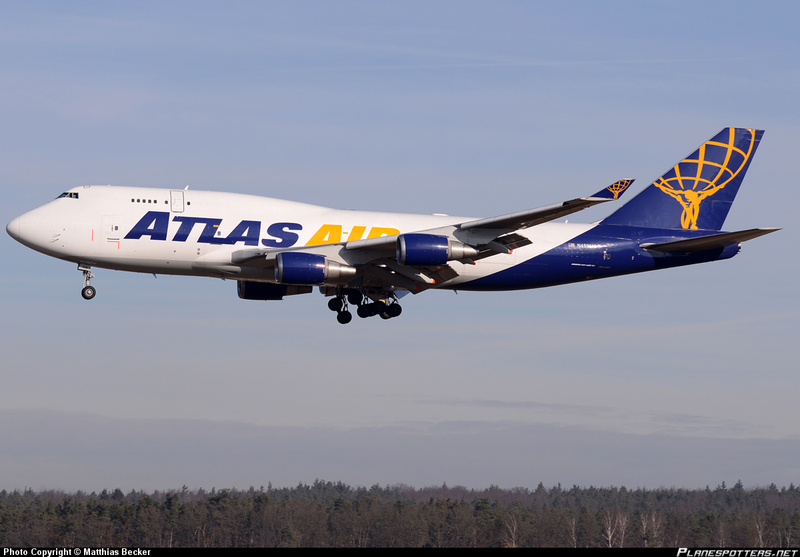 That is certainly an Atlas Air flight. Are we referring to the MA370 debacle by any chance? Ian, look at the date of Mick and Jay's posts on this thread and the date of Becky's facebook post. They aren't canisters, it's a photo that shows movement of the camera during a slow shutter speed. Are we referring to the MA370 debacle by any chance? Not a chance. 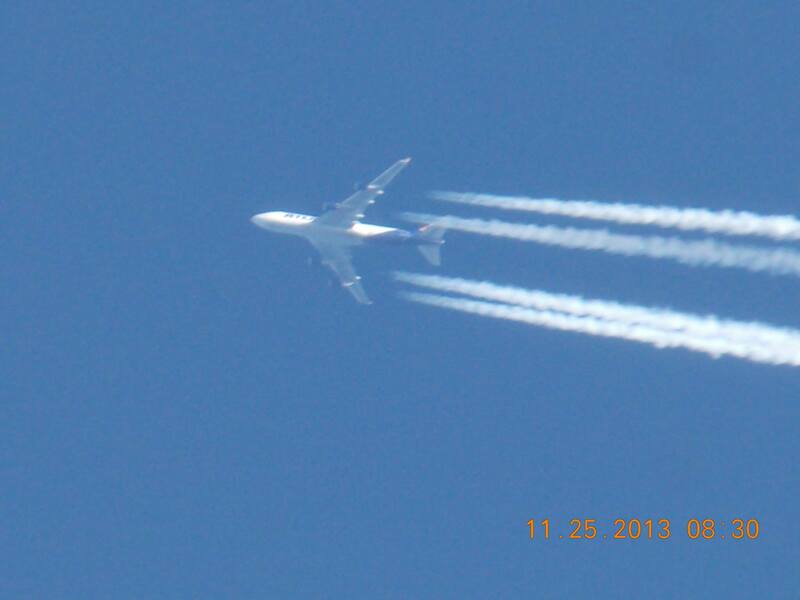 The Opening Post was in reference to an obvious four-engine airliner...in this case, a B747. The B777 (MH370) only has two engines. 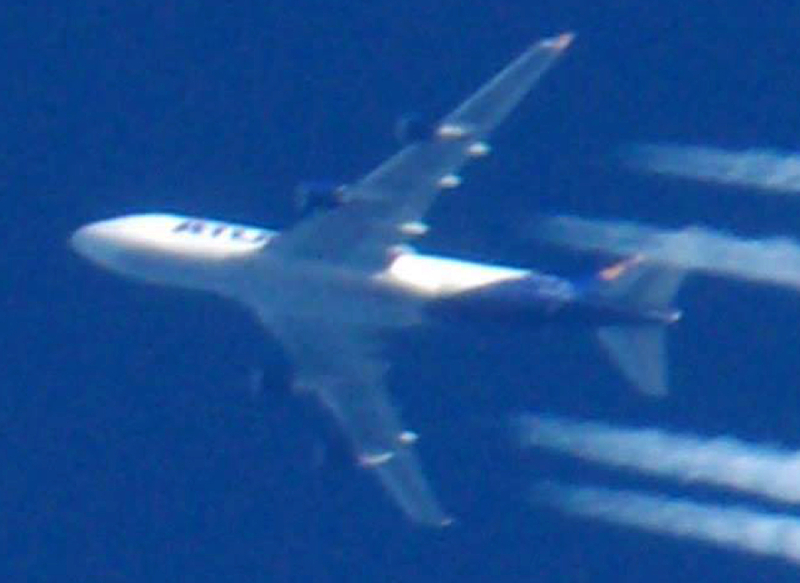 Another (two) current production airliners that have 4 engines are the Airbus A340 and A380. A new Airbus design is about to be introduced, the A350, but it is another twin engine jet. The ([...]) reference to "four canisters under the plane" appears to be a simple misconception about the engine nacelles....OR perhaps the fact that at least four prominent fairings on the underside of the wings (not symmetrically illuminated, BTW) are highlighted by the Sun's angle of illumination at the time the photo was taken. Those are termed often Flap Track Fairings, or "canoes" (based on their shape). These are to smooth airflow over the mechanisms responsible for extending the Trailing Edge Flaps. The fairings ("canoes") are clearly visible. They are also often sized to provide transonic area ruling, reducing wave drag. Most jet airliners have a cruising speed between Mach 0.8 and 0.85. For aircraft operating in the transonic regime (Mach 0.8-1.0), wave drag can be minimized by having a cross-sectional area which changes smoothly along the length of the aircraft. This is known as the area rule, and is the operating principle behind the design of anti-shock bodies. Reducing wave drag improves fuel economy.